In the Ocala National Forest of Florida, a black bear cub digs through trash, only to have its head become encased entirely in a plastic jar. It takes the Florida Game and Fish Commission 10 days to finally track down and rescue the cub. A California brown pelican carries around a plastic bag twisted low around its neck. On a protected reserve in Brazil a boa constrictor is found with a PVC (polyvinyl chloride) plastic ring slipped over its body, forming a tight noose. A stork in Europe has its entire upper body sheathed inside a large plastic bag. Herons, ducks, opossums, and gulls are entrapped by six-pack rings. These are just a few of the disturbing images that demonstrate the harm that can befall our wildlife from plastic waste. Humans produce as much as 300 million tons of new plastics across our planet each year. Plastic production worldwide just keeps growing as it displaces other durable (but more expensive) materials, like glass and metal. Today, an average person living in Western Europe or in North America uses around 200 pounds of plastic annually, mostly in the form of packaging. According to the United Nations Environmental Program, 20-40% of the plastic used worldwide is disposed of in landfills, where its resources are wasted, taking up valuable space, blighting communities, and harming wildlife. A mere 12% of plastic waste gets recycled, with unrecycled plastic materials typically getting sent to landfills where they may take as long as 1,000 years to decompose. Unlike paper or cotton, plastic does not biodegrade. It only breaks up into smaller and smaller pieces over very long times. These fragments, along with manufactured micro-plastic beads, pose an even worse hazard to aquatic wildlife. The U.S. Environmental Protection Agency estimates that somewhere between 500 billion and a trillion plastic bags alone are used worldwide each year. And less than 1% of these bags ever end up being recycled. Consequently, they pose a severe hazard to wildlife, both on land and in our waters. More than 250 species of fish, sea turtles, marine birds, seals, whales and dolphins have suffered from eating or becoming entangled in marine debris from plastics. So what can you do to help protect wildlife from plastic? Recycling is a good step – but purchasing a product that uses plastic to begin with can simply continue to drive demand. The most common single-use plastic items are bottles, bags, straws, utensils, lids and cups. Find reusable, non-plastic alternatives for these items, like canvas grocery bags or stainless steel straws. Another way you can help is to encourage your local government to ban plastic bags. Some are already doing this in supermarkets, drug stores, or even all retailers. You can also pick up any plastic litter you see and place it in a recycling bin, and you can organize a community cleanup day and volunteer to pick up plastic litter on the beach, near local streams, in a nearby park, or along roads. It’s also important to remember that plastic debris is more than just a litter problem. To understand the full range of its impacts, we need to look at plastic big and small. Later this month, we’ll cover microplastics – a nearly invisible but equally devastating threat to wildlife. There’s something about the promise of a deep cleansing that Shivani Kharod can’t resist. Her bathroom cabinet once housed a collection of enticingly scented products designed to deliver that squeaky clean feeling, concoctions like foaming passion fruit facial exfoliant and warm vanilla sugar body scrub. Then she started studying biology in college and became more aware of how products we routinely use can adversely affect our environment. Kharod discovered that her face wash, body scrub and even her toothpaste contained “microbeads,” tiny plastic pieces that eventually end up in our oceans. In fact, a tube of face wash can contain more than 330,000 beads. Not only do the beads interfere with digestion and deprive wildlife of necessary nutrients, they can also carry known carcinogens, like PCBs, DDT, flame retardants and other industrial chemicals. These persistent organic pollutants are hydrophobic, meaning that they repel water and stick to the beads, says Kirk Havens, a Virginia Institute of Marine Science researcher. These toxic pollutants also collect in animal tissues. This means that animals higher on the food chain face greater health risks because they eat and store more pollutants. Some states are starting to try to ban the use of nonbiodegradable microbeads, found in many popular brands, including Aveeno, Clean and Clear and Crest. Meanwhile, some companies are getting the message: Unilever, Proctor & Gamble, Johnson & Johnson and others have agreed to stop using microbeads by 2017. They’re looking to biodegradable alternatives such as cocoa beans, apricot shells, ground nut shells and salt crystals. Don’t purchase products containing these small but harmful plastic balls. Check the label. 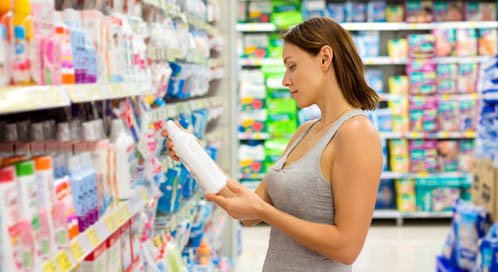 If the ingredients include polyethylene, polypropylene or polysystrene, then microbeads are present.